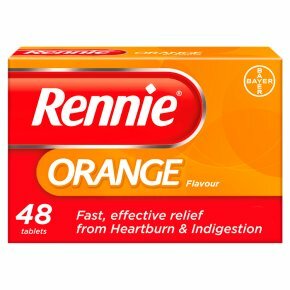 Fast effective relief from indigestion and heartburn.Calcium Carbonate Rennie Orange Flavour neutralises excess stomach acid and provides fast relief from indigestion, heartburn, acid indigestion, nervous indigestion, flatulence, upset stomach, dyspepsia, biliousness and indigestion during pregnancy. Read the enclosed leaflet carefully before use. Dosage: Adults and children over 12 years: Two tablets to be sucked or chewed, as required, preferably 1 hour after meals and before bedtime. For heartburn an extra 2 tablets may be taken between these times. These does may also be used during pregnancy and breast-feeding. Do not take more than 16 tablets a day.<br>Prolonged use should be avoided.<br>Children under 12: Not recommended.<br>If symptoms persist after 14 days consult your pharmacist or doctor.<br><br>KEEP OUT OF THE REACH AND SIGHT OF CHILDREN.